Uludağ (pronounced oo loo daa) is a national park and wintersports resort in Southern Marmara of Turkey. With its 2,543 mt/8,343 ft summit, Uludağ is the highest mountain of northwestern Turkey. There are some reports and photos that claims its summit is visible from Istanbul about 150 km north as the crow flies on clear days, though this is usually not the case due to humidity. Uludağ has two sides to it: On one side, it's an untouched natural beauty of forests, hills, and rocks overlooked by eagles and on the other it's a heavily-used resort of wintersports. One might argue there is a third side as well, the relatively small-sized but well-used daily-use areas that are filled with kebab-odour that disseminate from grills of open-air restaurants. Uludağ was one of the twenty-odd mountains around the eastern half of Mediterranean basin that used to be called Olympos in ancient times—more precisely Mysian Olympos in this case, Mysia being the ancient name of the region what is about eastern two-thirds of Southern Marmara today. In medieval times, Uludağ served as a hermitage to Christian monks, which explains why it was named Keşiş Dağı ("Mountain of the Monks") in Ottoman Turkish. It was also this time when, in the absence of refrigators, the ice harvested from the mountain made its way to the imperial kitchen in Istanbul's Topkapı Palace. The mountain was later renamed Uludağ, which translates "Great Mountain" ("great" being more in the sense of "grand"), in 1935, about a decade after the Turkish Republic was founded. Uludağ was the first (and, still the most popular) wintersports resort in Turkey, with the first guesthouses aimed at skiing enthusiasts opening in 1940s. It was declared a national park in 1961, but that didn't fully stop tourism developments. Northern side of the mountain overlooking the city of Bursa (though you should be darn lucky to have a glimpse of the city from most locations on the mountain) is dotted with a number of flat plateaus around 1,600 mt above the sea level: Sarıalan (the main daily-use area and where cable cars from Bursa terminate), Kadıyayla (where the cable car pauses before heading forward to Sarıalan), Karabelen (when approaching by road, the national park gate is situated here), and Kirazlıyayla (the first plateau after the park gate) among others. The southern slopes of the mountain is far steeper and is less accessible. Uludağ is one of the places where school geography textbooks come true: the mountain has belts of different types of vegetation varying with the elevation. The lowest slopes bordering Bursa, up to 350 mt above the sea level is covered with Mediterranean shrubs (maquis), such as laurel trees. Between 350 through 700 mt, it's the warm temperate decidious forests dominated by chestnut trees (this zone is where most of those delicious chestnut desserts unique to Bursa originates from). It's the time for cool temperate decidious woods between 700 to 1,500 mt, dominated by beech trees. 1,500 to 2,100 mt is the highest belt that still allow trees to grow, dominated by indemic firs of Uludağ. Tree-less and fragile alpine meadows cover the areas of mountain above 2,100 mt. Bears, wolves, deers, and eagles among others are the dwellers of Uludağ. As you may be expecting, Uludağ is far chillier than nearby Bursa thanks to its elevation. The wintersports season, especially skiing, is between October and April, with a guaranteed stable snowcover and constant below freezing temperatures between December and March. A summer day that is sweltering hot in Bursa is likely to be cool enough that makes it really uncomfortable without at least a cardigan outdoors in Uludağ during the day and definitely at night. The narrow (wide enough for vehicles to pass side by side though) and tarmac road from Bursa (with signs pointing it all around the city) winds on the side of the mountain for 22 km until it arrives at the national park gate at Karabelen. 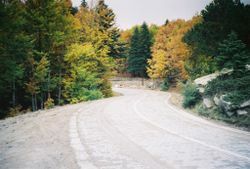 After the gate, it turns into—or rather isn't upgraded from since it was opened—a cobbled road, presumably to force drivers to lower their speed, so that driving under icy conditions in winter on this winding road is safe. The cobbled road lasts for 8 km until Sarıalan, or 12 km until Oteller (area where all hotels are clustered). In winter, vehicles without tire chains may not be allowed to go further than park gate if park authorities decide so (which usually do so in heavily-snowing days). Fortunately, you'll see a lot of stalls run by local people on sides of the road which sell chains—though they'll for sure try to rip you off if it's one of those no-cars-without-chains days (like trying to sell the chain for up to 100 TL, whereas it would cost about 15 TL elsewhere). Whether a snowy day or not, winter driving rules apply. 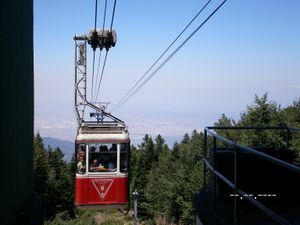 8-person cable cars (teleferik) from Bursa's upper neighbourhood of Teferrüç on the foothills of the mountain (minibuses with signs Teferrüç – Teleferik get there from central Bursa) take a much more direct route than the road. It takes around 20-25 minutes to get to the Sarıalan station located at 1,634 mt above the sea level. Because of space constraints, no skiing/snowboarding equipment is allowed in the cable car, but fortunately you can rent them up on the mountain. As of 2018, teleferik ride from Teferrüç to Çobankaya costs 70 TL pp return. 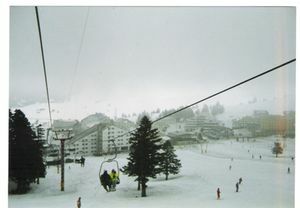 Cable car service may be cancelled due to bad weather, especially in wintertime. If that's the case, then you can take 15-person dolmuşes from Bursa, which have no fixed hours, and depart when full. Their departure stop is in Tophane, next to the Saltanatkapı gate of old city walls. It takes around 50 minutes to get to Oteller, their last stop in Uludağ, by these dolmuşes and a one-way trip costs 9 TL pp. There are also dolmuş taksis with a capacity of four passengers available, which naturally have less waiting times until they are full, and which cost 15 TL pp one-way. A flat rate—which doesn't depend on the number of passengers—for vehicles is charged at the national park gate. Bigger the vehicle, more expensive the fee (though not prohibitively so). Minibuses (dolmuş) are available from Sarıalan cable car station to Oteller area, about 10 km away and where all of the hotels are located. NB as of August 2018, I'm unsure if minibuses operate between Sarıalan and Çobankaya, as teleferik can now take you all the way. 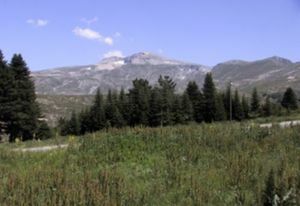 After changing over at Sarıalan, the teleferik continues to Çobankaya plateau 3 km away and about 100 mt higher than Sarıalan. At Bakacak Plateau a kilometre north of Çobankaya—where gondola lifts from Sarıalan terminate; accessible by a paved road from there as well as from Oteller area—you can have a large overlooking view of the region around the mountain, including the city of Bursa just north of Uludağ, and Lake Apollonia (Apolyont Gölü or Ulubat Gölü in Turkish), about 50 km to west. On your way there, you may also check out Çobankaya—literally "shepherd's rock"—itself, a huge granite boulder, situated on the side of the road. The "two sides" of Uludağ is also evident in the activities it offers: in wintertime it's skiing down the white slopes, in summertime it's taking a walk amidst the woods. Uludağ is the oldest wintersports resort of the country with the first hotel opened in 1940s. Uludağ offers a number of tracks between fir trees, each with a different level of hardness. Lots of teleskis are available, though unlike many other wintersports resorts around the world, there is not a universal teleski pass system in Uludağ, so you may have to pay each time you use a teleski unless you are using your hotel's own, although there are daily passes valid for each individual teleskis, which cost 80 TL a day. Skiing equipment can be rented on the mountain for 15-25 TL a day. Although none of them waymarked, there is a number of hiking trails on the mountain, with the most popular ones being the trail through the forest from Sarıalan to Çobankaya and the trail above the treeline to the glacial lakes and the summit, which you can start from the abandoned wolfram mine (location simply known as Volfram) east of Oteller area. Cost of teleferik is 70tl return (2018). Each cabin fits 8. There is no need to hop off at Kadıyayla any more. The teleferik continues directly to Sarıalan station. You must hop off here. The journey from Teferrüç to Sarıalan takes 20 minutes. There are many cafes and restaurants at Sarıalan, and even little shops selling fruits and vegetables. There are also many picnic tables. You can hike from here to Çobankaya. The trail will be amongst trees, and judging from above in the cable car, you wouldn't have many views. Cable car from Sarıalan to Çobankaya takes 20 minutes. There are some more cafes and shops at the station. From Çobankaya to Volfram gondola station is about 15 minute walk (along the road) or 4 minute drive. There are taxis available and they'll charge about 20tl. For Volfram gondola you must buy a separate ticket (40 tl return). Journey one way 10 minutes. It would be possible to walk up instead; It might take 1 hour. Then the hiking finally begins (there is no signage though). There are no trees or anything blocking your view, so you can pretty much choose your own way. There is a wide gravel road that it seems you can take. It can take circa 1.75 hours to walk from top of Volfram gondola to little summit (there is an abandoned little hut here). From the summit — the roof of northwestern Turkey - it's said you can catch a glimpse of part of the distinctive crocodile-like shape of the Sea of Marmara and a distant silhouette of Istanbul beyond on clear days—while the one to left leads to the lakes—four of them roughly in a row, most of which are partly ice-covered even in the height of summer unless in an exceptional year. Hiking Volfram to either location (summit/lakes) is said to take around 3 hours—though those wishing to see both the summit and the lakes close-up better take their camping gear with them since, although near each other, hiking to both locations and then back at the same day is said to be demanding. NB last teleferik cable car for the day departs Sarıalan at 21:00. Last gondola departs Volfram at 18:00-19:00 (depending on when the boys feel like finishing work for the day). There are a number of kiosks/grocery stores on the mountain, although like almost anything else offered by commercial establishments in Uludağ, they provide snacks and drinks for about three times of what you'd pay elsewhere. Around Sarıalan is a number of open-air Kendin Pişir Kendin Ye ("Cook it yourself!") restaurants mostly favoured by Middle Eastern (especially Saudi) families where you buy your meat by kilo and rent a grill with some charcoal and cook your kebab yourself. Most, if not all, of these restaurants are open round the year. Otherwise, all hotels in Uludağ are full-board and you'll have your meals in your hotel. Uludağ is a word you will quite frequently notice on water bottle labels in Turkey, while travelling in northwestern parts in particular, as the springs and creeks in the foothills of the mountain provide much of the country's bottled water, especially those produced by bigger brands. The cafés and bars of the hotels are open to anyone (for a fee, unless you stay there, of course). Expect to pay dearly, though—a cup of coffee can easily cost 15 TL in winter. Although a national park, being a wintersports resort means that those prefering a luxurious bed rather than a bumpy mat under the tentfloor won't be dissappointed in Uludağ. All hotels in Uludağ are located in Oteller (literally "hotels") area, which is divided into 1. Gelişim Bölgesi, the older development area and 2. Gelişim Bölgesi, the newer development area with a few km inbetween. 1. Gelişim Bölgesi is reported to be livelier than 2. Gelişim Bölgesi. Many hotels in Uludağ, though, are aimed at skiers and thus are closed during summer. Organized campgrounds run by Turkish Ministry of Forestry can be found in Sarıalan and in Çobankaya. It's possible to wild camp pretty much anywhere—apart from the obvious skiing tracks, of course—in the mountain. However, highest areas are covered with alpine meadows, some of the most fragile ecosystems in the world, so it's important to follow leave-no-trace guidelines. A heavy fog can quickly set on any day in Uludağ, even on a perfectly sunny one. With the loss of sight of natural distinguishers, it becomes fairly hard to follow the trails, especially on the higher meadows of the mountain, so stay ahead of weather forecasts if you're planning to hike. If you are trapped in fog, the best would be to wait until it goes away—it can rise as quick as it forms. Bear encounters may take place in the remoter parts of the mountain. Getting out of the mountain generally means backtracking to Bursa, although there are some tracks leading to remote villages at the eastern and southern foothills of the mountain. This page was last edited on 30 August 2018, at 17:00.